There's nothing like a good-looking banner stand for ROI, and inexpensive, immediate results! 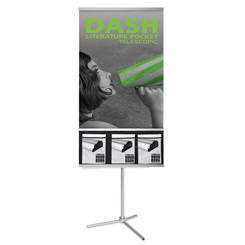 If designed properly, a banner stand can showcase your company's benefits at trade shows, client meetings, community events and even in your own lobby 365 days a year! Brainstorm has access to over 50 separate models of stands and 4 different graphic substrates, but we find that most everyone needs one of a few types. Widths: 23" / 32" / 39" / 48"
Heights: Nearly every stand we sell will adapt to tabletop AND floor use. Non-retractable stand with built-in literature pockets. For frequent exhibitors especially, can be used as both a tabletop or full-size display. Our unique alignment system keeps the graphic looking its best. Available in 2,3 or 4 banner groups. Versatile!